Social Tab – Share links to websites, videos and more to Facebook. As before this is a closed Beta. A Beta code is required to download it. Bitstream was nice enough to share a code exclusively for WapReview readers. The code is “wapreview“. To join the Bolt Android Beta program and get your unique one-time download link, go to http://boltbrowser.com/android/ and enter your name, email address and the code: wapreview The link will be emailed to you so you need to use a valid email address. 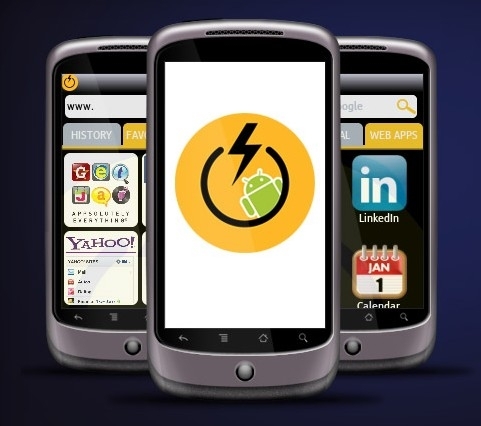 Bolt is compatible with Android 2.1 or latter. Unfortunately I was unable to get the new Beta to work on my T-Mobile My Touch 3G (HTC Magic) running a rooted version of the stock Android 2.2 ROM. Bolt hung at startup. The first Beta worked on this phone so I’m surprised this one didn’t. Hopefully you will have better luck. If you do get it working please leave a comment sharing what you think of the new Bolt release. This entry was posted in Browsers and tagged Android, Bolt, Bolt Browser Beta Codes by Dennis Bournique. Bookmark the permalink. I realy love bolt bowser so much…….just because is ok and very faste. 1) It is working slow in 3g service also. 2) I am not able to login Windows live or hotmail email ids. 3) Font is not so good. 4) New tab adding option will look good on title bar. Generally I wouldn’t bother to install an app that asks for too much permissions. Why on earth a browser needs to read my contacts and send SMS? First beta had a clunky interface with mouse cursor (?). I wonder if they just wrapped Java ME version in apk. Yeah, it,s working on mine (a rooted zte 850 with modified 2.2) but the font is still all wrong (too large and can,t be modified) and doesn’t do full screen which on my small device makes it more or less unusable. But it’s coming along! Thanks for the code, Dennis!